Characteristics of a Great Power Coach® - Coaching and Leadership International Inc.
Loving Presence (sees the Client and self as faultless/blameless). Mindfulness (deep listening and awareness). Purity in thoughts, words and actions: keeps all three positive. Intuitiveness (what's the real challenge or goal here?). 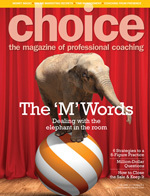 Neutrality: as the Client is responding to questions, the Power Coach keeps their own responses neutral - showing neither approval or disapproval. Uses The Universal Laws as a basis of understanding human behaviour. Allows the Client to develop their own solutions while mentoring if necessary. Uses tools which assist the Client in truly understanding what is holding them back from achieving their goal. Expects no outcome or reward: ego is in the back garden, puts the responsibility and accountability in the heart and mind of the Client. Follows the CLI Success Triangle which includes coaching self every day to become wiser, more peaceful and more grounded. Understands and demonstrates the ICF International Coach Federation Core Coaching Competencies and the ICF Code of Ethics in their daily coaching business. Is a student of body, mind and spirit. Understands the connection between the three. Creates an "enjoyable" experience for the Client. Understands how our patterns of living are stored in the unconscious and uses tools to permanently change unconstructive patterns into positive ones. Assists the Client in profiling their strengths, areas of improvement and goals. Assists the Client in determining the Real Issue or Real Goal to be worked on that day. Practices neutrality, loving presence and mindfulness in order to create a safe environment for the Client to fully explore roadblocks and solutions. Selects the best tools and uses a high level of intuition to maximize the learning. Facilitates the release of the emotional charges in order to promote nourishment of thinking cells and create a positive shift in thinking. The Client can then tap into their highest creative centres to generate innovative solutions. Assists the Client in developing solutions within a Plan. Mentors when and if necessary. Asks for a commitment to their plan. "It is our unconscious that holds the power of a Leonardo da Vinci or an Einstein." - Win Wenger, "The Einstein Factor"